Flowering from early spring to late summer the drumstick primula is a worthwhile addition to any planting scheme requiring spring colour. Found in moist alpine regions from Afghanistan to South East Tibet and Burma, they are ideally suited to well drained, acidic, moist soil in full sun or partial shade. Grown for its pom-pom shaped flowerheads, the trumpet or bell shaped flowers come in a variety of colours, (mauve, pink and white) all with yellow-eyed centres, above a rosette of spoon shaped mid-greed leaves. 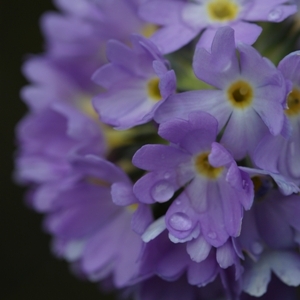 This unusual primula has an altogether sturdier, architectural form compared to that of the more common delicate primulas and looks great in group planting.